Just one game is all it took. The New York Rangers are chasing the playoffs in a mad dash as the Pittsburgh Penguins and Sidney Crosby close in on the Blueshirts. The New York Rangers have had a magical season catapulting to the top of the Eastern Conference standings and securing a strong playoff position. Lurking behind in the standings have been the Boston Bruins, and on a few occasions the Philadelphia Flyers have come too close for comfort. But the Rangers have smoked both the Flyers and Bruins, and have continued to play the tough hockey Coach John Tortorella promotes. The Rangers refuse to cruise in style to the playoffs, but with Captain Ryan Callahan and lucrative defensman Michael Del Zotto out, the Rangers had a rough course to play when the Pittsburgh Penguins came to town, bringing with them their star player. Crosby returned from a three-month absence facing a media blitz in New York, but faced boos at Madison Square Garden. After recovering from recurring concussion symptoms Crosby was back in stride beating the New York Rangers 5-2 for Pittsburgh’s 10th straight victory. It’s just one game for the Rangers who need to maintain their fight into the playoffs. Sidney Crosby is the man to beat. Despite his absence, the Pens have continued their rampage of the Eastern Conference coming within four points of the Rangers. 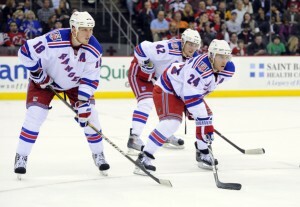 While Crosby hasn’t played for months, the Blueshirts are not taking his return lightly, nor the loss. Coach Tortorella wasn’t pleased with the outcome Thursday night citing the team’s depth must go deeper and fill in crucial gaps. While the Rangers plays gutsy, in-your-face hockey, the leading line of Brad Richards, Carl Hagelin, and Marian Gaborik are pulling most of the weight. Injuries to Callahan Del Zotto have crippled the team in their usual defensive style as the Rangers block shots, and then move into the passing lanes taking advantage of every mistake. Artem Anisimov , who has been a consistent scorer, had to leave the game in the third period increasing the stall in offense. Defensman Marc Staal led in ice time with 26:02, but mishandled a puck that led to two Penguins goals in the third period. The Blueshirts need to get proactive. Injuries may slow a team, yet it shows the team’s weaker links. Sitting in a top spot in Mid-March and with a dozen games left in the season, the Rangers are losing ground. The Penguins have climbed steadily without Crosby or top quarterback defender Kris Letang, who also returned to the lineup on Thursday logging 24:17 in ice time. New York’s Vezina candidate, Henrik Lundqvist, was out with the flu for Crosby’s debut, so Martin Biron took over. Biron has been a steady backer in net for King Henry and the two are a strong duo to take it all the way. Players like Brian Boyle, Brandon Prust, and the others must get their hands dirtier if they want a piece of the Cup. All the hard work, performing beyond expectations and the tight-knit group of players are in combat to hold on to their rank. Sharpening the details is the reference John Tortorella discussed in a post-game interview. While the Penguins are finally healthy, and the Rangers are not, it’s a fair assessment that the team can finish this run if their top players can return to the lineup. Just as the Pens increased their rank through injuries, the Rangers must do the same if they want to vie for Cup contention.